Marine 31 Gel Coat Gloss & Color Restorer quickly and effortlessly removes medium oxidation, yellowing and surface staining from your boat while maximizing gloss and color. Advanced diminishing abrasives and proprietary cleaning agents quickly remove surface imperfections while lubricating oils ensure a long buffing cycle and easy wipe off. Salt from the ocean and intense ultra-violet (UV) rays from the sun cause the gel coat on boats to oxidize and yellow, hindering the shine from the underlying finish. This chalky, white residue is an eyesore that takes away from the overall appearance of your pride and joy. Marine 31 Gel Coat Gloss & Color Restorer effortlessly polishes away years of neglect, making your boat look new again. Marine 31 Gel Coat Gloss & Color Restorer works by combining advanced diminishing abrasives with proprietary cleaning agents and hydrating nourishing oils. The abrasives do the majority of the work leveling the surface, removing the dead gel coat while the cleaning agents remove years of built up grime below the surface. As the polish is worked into the surface, nourishing oils feed the gel coat, maximizing gloss and color. Like the rest of the Marine 31 product line, Gel Coat Gloss & Color Restorer was developed and fine tuned right here in south Florida. Marine 31 Gel Coat Gloss & Color Restorer will pleasantly surprise you with how easily it wipes off. Even in direct sunlight, Marine 31 Gel Coat Gloss & Color Restorer is a pleasure to use. What's more, Marine 31 Gel Coat Gloss & Color Restorer can be applied by hand, circular polisher or dual action orbital polisher. Marine 31 Gel Coat Gloss & Color Restorer is harbor safe and eco-friendly. Shake well before using and ensure surface is cool to the touch. Apply an �X� of product directly onto light cutting foam or wool pad and spread product over a 2� by 2� area. Circular polisher: Set speed between 1200 and 1500 RPM. Random Orbital polisher: Set speed between 5000 and 6000 OPM. Practice a slow arm movement while applying medium pressure. Work product until it starts to turn clear. Remove residue with a clean, dry microfiber towel. 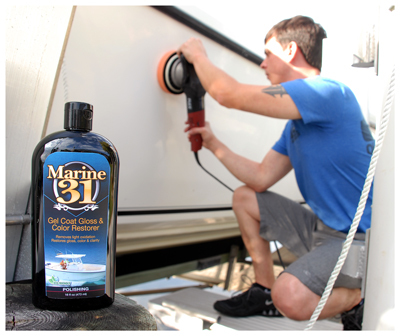 For maximum shine, follow up with Marine 31 Gel Coat Final Step Polish. Protect the finish with Marine 31 Gel Coat Carnauba Wax + Sealant. Includes 128 oz. and 16 oz.